Rev David Reid wrote the above article on the history of the church in 1967. This postscript brings Rev Reid’s original article up to date. Although, before doing so one item will be briefly mentioned which was given to the church long before 1967. 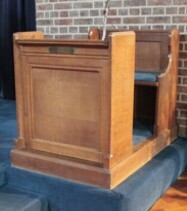 The prayer stall, next to the lectern, was donated to the church in March 1911, by the widow of the Rev George Kirkwood, in memory of her husband, who prior to his death had been the senior chaplain to the forces. On 30th November 1975 (St Andrew’s day) a new chapel in the church was dedicated. Initially called St Andrew’s Memorial Chapel, it has come to be known as the Cameron Chapel. A new screen and a communion table plinth were specially commissioned for the chapel. The screen commissioned is in a thistle pattern with the badges of Scottish regiments (plus the cap badge of REME) shown at the centre of the thistle heads. Major Percy Chivers (REME) was responsible for making and casting the gates and screen. 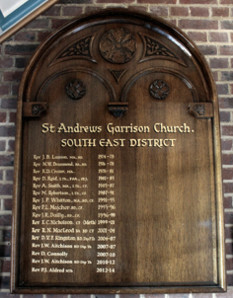 The church’s main lectern was donated by past and present members of the Army Physical Training Corps to the Garrison Church of St George, Aldershot, in 1969. In September 1983 it was transferred to St Andrew’s Garrison Church. The bible used on the lectern was given to the church by the Royal Corps of Transport on 5th February 1989 to mark the 50th anniversary of the rededication of the church. The Bible in the Cameron Chapel was donated to the church by the West of Scotland Bible Society in 1958. The biggest single addition to the church since 1967 has been the current organ. The organ itself is actually older than the church buildings and dates from 1897. It originally resided in St Ninian’s Church, Leith. 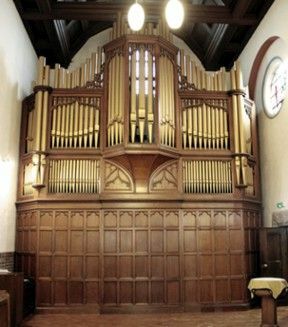 In 1984, the organ was restored and installed in St Andrew’s Garrison Church, following the merger of St Ninian’s Church with North Leith and Bonnington Church to form North Leith Parish Church. Fuller details of the organ and its history can be found at the page entitled "Organ" (press the link at the top of the page). Prior to 1984 the church had a succession of electric organs. The Regimental Crests Window, was originally intended to be sited in the north transept (behind where the organ is currently located), but by the time the window came to be installed, in early 1983, the process of acquiring a new organ was well underway and consequently a new location had to be found for the window on the south side of the church. The Regimental Crests Window is a composite of two previous windows - a circular one with 12 small, round, Scottish, regimental crests (originally from the Church of Scotland Canteen in Mandora Road, Aldershot - the church acquired this window around 1968, at which point it was stored, rather than erected), plus another window, with five larger regimental crests on it dating from the early Twentieth Century, which came from Smith Dorrien House, Queen’s Avenue, Aldershot. 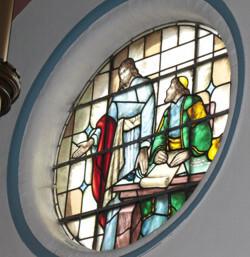 In the early 1980s, Rev David Reid, who was minister at the time, came across both windows and proposed incorporating them in one new window for the church. The cost of the new stained glass was met by the trustees of the St Andrew’s Scottish Soldiers Club Fund. The Church of Scotland Canteen, at Mandora Road, was part of the St Andrew’s Scottish Club & Home. The Club & Home were opened on 18th May 1916, funded by Scots from the South of England to provide a place of recreation (and additional accommodation) for Scottish troops barracked, at Aldershot, during the First World War. A chapel and a hostel for relatives visiting soldiers at the nearby Cambridge Military Hospital were added in 1945. For many years, the building also acted as a vestry for the ministers of St Andrew’s Garrison Church. The building was knocked down in the 1960s as part of military rebuilding in Aldershot, the main aim of which was to provide new barracks. More information about the Regimental Crests Window and the crests it contains can be found at the page marked "Regimental Crests" using the menu at the top of the page. Two further new stained glass windows have been added since ‘67. Next to the organ there is a circular stained glass window depicting St Matthew. The design shows St Matthew sitting at a table (with bags of money, loose coins and papers resting on that table) just at the point Jesus calls him to be a disciple. The window was given by Irene Sanderson, the widow of James Sanderson, in memory of her husband who died in 1981. James worked in a bank hence the choice of scene for the window - St Matthew being called by Jesus from his money responsibilities in the tax collector’s booth to serve God. At the opposite end of the church not far from the porch there is a stained glass window dedicated to Laurence Johnston (1904 - 1970) who had served as an organist in the church for many years. The window was gifted by his wife Anne in 1983. The theme of the window is music. At the centre is a St Andrew’s cross with a thistle head superimposed on it. The cross divides the window area into four parts. At the top, above the cross are two horns with a tuning fork in the middle. Surmounting that is an image of the burning bush. At the bottom of the cross there is a harp with a musical score to its left and a set of bagpipes to its right. Below that is the dedication to Laurence Johnston. The left quarter of the cross shows cymbals; the right quarter has a drum along with its sticks. Flower stands - the one on the left is in the Cameron Chapel, the one on the right is in the main body of the church. There are also two large flower stands in the church. One is located in the Cameron Chapel. It is metal. The other is located in the main body of the church near the apse and is made of wood. 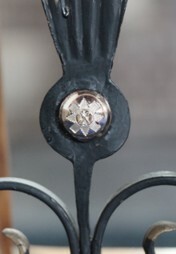 The Cameron Chapel flower stand was given in memory of Major Percy Chivers (who designed and made the gates and screen for the Cameron Chapel). It was manufactured by the apprentices of 43 Command Workshop, Royal Electrical & Mechanical Engineers, Aldershot and presented to the church by Lt Col (Retired) JA Moore in April 1977. 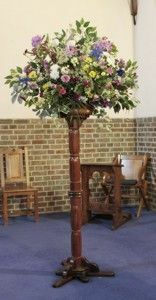 The wooden flower stand was made by Mr BA Martyn, the church clerk, and presented by him to the church on Easter Sunday 1991. Mr Martyn had also previously (in 1983) given the church its wooden collection plate. The font in the Cameron Chapel was given in memory of Major General KA Buchanan of the Seaforth Highlanders who died, in 1973, aged 93. In the porch there are two war memorials from Aldershot Presbyterian Church (later a United Reformed Church) which, following the closure of that church building in the 1970s, were transferred to St Andrew’s Garrison Church. Both plaques date from World War 1. One is for the congregation as a whole and lists the members who died in the 1914-18 War. 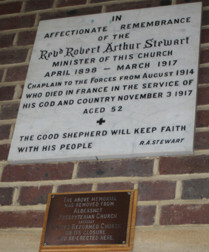 The other plaque is specifically for the minister Rev Robert Arthur Stewart who died on active service, in France, in 1917. Also in the porch, are two boards which list between them the previous ministers of St Andrew’s Garrison Church. The more recent of the two boards was supplied, in 1974, by the Royal Electrical & Mechanical Engineers when the previous board filled up. Its style directly copies the previous board.